November | 2015 | Daniel Katz, Ph.D. I don’t think anyone has shared this advice with Eva Moskowitz. The Success Academy charter school CEO just had a truly horrible October, in which her suspension policies were put into an uncomfortable spotlight, she retaliated by publishing the disciplinary records of a former student who is only ten years old and by demanding an apology from PBS, a complaint about Moskowitz’s violation of privacy laws was filed with federal DOE, and The New York Times ran a blockbuster story on how one of Moskowitz’s principals kept a “got to go” list of students who he deliberately pushed out of his Success Academy, confirming what data already shows: Success Academy uses a combination of excessive punishment and direct pressure to remove students who win lottery seats at the school. Paul’s students had to sit with hands clasped and look at whomever was speaking (called “tracking”). They couldn’t stare off into space, play with objects, rest their head on their hands in boredom, or act like what Paul called “sourpusses” who brought an attitude of negativity or indifference to the classroom. Paul made students demonstrate to him that at every single moment they were focused on learning. Readers are obviously supposed to infer that Mr. Fucaloro’s methods are so fool-proof that any sufficiently determined teacher can employ them with any group of students and achieve the same results which explains the sky high results on state examinations in her network of schools. Moskowitz claims that she was essentially a pedagogical blank slate who was only convinced by Paul Fucaloro’s astonishing results and then perpetuated his methods so effectively that Success Academy schools can literally have almost any teacher command almost any class’ full attention all day. This narrative is not believable on numerous fronts. First, it is nearly impossible to believe that Eva Moskowitz went into the development of her charter school network a complete naif with no idea how she wanted the school to operate. Whatever criticisms she has earned over the years, not knowing her mind is hardly typical. Daniel Bergner of The New York Times published a hagiographic portrait of Moskowitz in the summer of 2014 in which the 1982 Stuyvesant graduate could not contain her contempt for what she saw as lax standards at New York City’s most selective high school. As a member of the New York City Council, Moskowitz was known as tough, confrontational, and an expert on education issues while her demanding managerial style led to high levels of turn over among her staff. Moskowitz’s own impatience with other people is even evident her only published work of scholarship following her doctoral degree in history. The book, published in 2001, is titled In Therapy We Trust: America’s Obsession With Self-Fulfillment, claiming that Americans today turn to psychology and self-help experts for guidance and “excuses” as fervently as they used to seek religious guidance. Such negative assessments of most her fellow citizens’ needs probably explains why she reacted with overt derision when Mayor Bill De Blasio sought to implement restorative discipline strategies in city schools. Suffice to say that I find it laughable that Eva Moskowitz had no idea how strict a discipline system she wished to implement from the beginning. Such attitudes appear foundational and durable at Success Academy given Kate Taylor’s report on the network’s “polarizing methods” for The New York Times earlier this year where public shaming of low performers is common enough that children have been known to wet themselves from the stress. Mr. Fucaloro’s stance on disabilities is particularly shocking, however, and indicative that Success Academy’s Director of Instruction did far more than teach Moskowitz’s teachers to have high expectations for student behavior – and that his methods go far beyond anything he was allowed to do as a public school teacher. Simply ignoring an IEP and subjecting students with disabilities to behavior modification is not an option for public school teachers (unless abetted by an unethical administration). Nor is a Kindergarten “boot camp.” Nor is out of school suspension for five year olds. Nor is a 65 infraction long behavioral manual. This list is lengthy, but the message is clear: far from simply being inspired by the high expectations Mr. Fucaloro and his singular attention to student focus, Success Academy teachers are trained in a program of extreme behavior modification backed by punitive consequences, options that are neither professionally nor morally available to truly public schools. Two items are of note here. First, the pattern of student attrition is curious. Success Academy has not backfilled vacated seats after third grade until this year and still only does so through fourth grade, claiming that admitting new students unused to Success Academy methods would be detrimental. It is therefore not surprising to see how many of the cohorts in the chart show drop offs around third and fourth grades – any students who left the school were not replaced as is required policy for fully public schools. This pattern repeats cohort after cohort with growth in early grades, followed by sharp winnowing accumulating over time. The third Kindergarten cohort is especially noteworthy, growing from 130 students in 2008 to 136 by third grade before shrinking to 109 two years later in fifth grade, an almost 20% change. Remember, every student who begins at a Success Academy represents a family that went out of its way to seek out that school. Of course, cohorts in PS149 do experience attrition as well, sometimes significant attrition, but there is no specific pattern of when students leave the school or of when cohorts shrink or grow. However, the most striking difference is the out of school suspension rates which top out at 9% and are as low as 3% for two successive years. Whatever else is happening at PS 149, the school is not heavily wielding out of school suspension with its students. What does this mean? The most obvious inference is that even if Moskowitz is being truthful and that Mr. Fucaloro is an astonishing teacher who was quickly able to establish a well disciplined and effective classroom environment where others struggled, it was far harder to scale up that level of discipline and effectiveness without massively increasing punitive disciplinary consequences, including out of school suspension rates nine times higher than a co-located school in the 2011-2012 school year. The “secret sauce” at Success Academy’s setting of behavior for its students is not duplicating “the most gifted educator” Moskowitz has ever met – it is sending very young children home from school, sometimes until their parents give up and go away. By the way, the out of school suspension rate for 2011-2012 at Upper West Success, a school where 29% of students qualify for free lunch and 10% for reduced price lunch? 5%. Apparently suspension rates in the high 20s are a necessity for schools where 78% of the students are in or near poverty. Some critics find our approach rigid and overbearing. I’ve got two of these critics in my own home: my kids, who attend Success. They complain when they get into trouble for not tracking the speaker. They were listening, they protest. Maybe so. But sometimes when kids look like they’re daydreaming, it’s because they are, and we can’t allow that possibility. “Daydreaming….and we can’t allow that possibility.” Nobody denies that a well managed environment where students are attentive is a big part of successful teaching. Nobody even denies that some teachers have an incredible capability for that and others can learn from them. But at the point when your desire for order and control cannot allow the “possibility” that a very young child might occasionally daydream during a long school day, you are no longer practicing classroom management. You are engaging in a pathology. Education reformers in the 21st Century seem incapable of seeing any problem as something other than a marketing campaign. Faced with growing grassroots opposition to the Common Core State Standards, the Thomas B. Fordham Institute, backed with fresh cash from the Gates Foundation, launched a #SupportTheCore event on social media to try to make CCSS support look genuine and natural. As they felt control of the education reform narrative slipping from their grip, major corporate backers of standardized testing and school privatization handed $12 million to former Arne Duncan aide Peter Cunningham to launch The Education Post, a pro-reform blogging outpost, providing content for itself and editorial pages. Needing to dress up her campaign to destroy the collective bargaining and due process rights of our nation’s teachers as something more noble, former news anchor Campbell Brown set up her own web headquarters called The 74, referencing the estimated 74 million children under the age of 18 Brown claims she is defending from greedy unions. It seems that whenever they want to tackle difficult and contentious issues, reform advocates turn immediately to the tools of viral advertising and public relations to create the imagery of genuine, natural support rather than bothering with the hard work of building it. Let’s agree to set aside the choice of a name that inevitably invokes one of the worst doping scandals in the history of sport (although, seriously? millions of dollars in expert branding experience and nobody thought about that??). “Teach Strong” is the name chosen by a new group of stakeholders organized by the Center for American Progress to make teachers and the future of teaching an issue in the upcoming election. The campaign launched this week with a splashy web site and social media campaign, which is is par for the course these days, and a declaration of 9 “principles” that they believe will “modernize and elevate” the teaching profession. Lyndsey Layton mentioned in The Washington Post that the coalition includes “some strange bedfellows,” and she certainly was not kidding. On one side, Teach Strong has both major national teacher unions, the NEA and the AFT. It also has the American Association of Colleges of Teacher Education, the national association of college based teacher preparation programs, and it has the Association for Supervision and Curriculum Development, a long standing national organization for public school leaders. Also in the coalition is the National Board for Professional Teaching Standards, which grew out of the Carnegie Forum on Education and the Economy’s response to A Nation At Risk and the National Commission on Teaching and America’s Future, whose early work was heavily influenced by executive director Linda Darling- Hammond, indisputably one of the leading experts in teacher preparation. Teach Strong is also joined by the National Center for Learning Disabilities, a long time education advocate for disabled children and by The New Teacher Center, a non-profit that grew out of the nationally recognized teacher mentoring and support program at University of California, Santa Cruz and which now assists states and school districts across the country in developing new teacher induction and mentoring. On the other side? There is the omnipresent Teach for America which recruits high achieving college students, gives them less than two months of preparation, and then places them in some of our nation’s highest need school districts for two years. They are joined by “Educators 4 Exellence,” a foundation funded astroturf group dedicated to promoting the Common Core State Standards and hosting a pledge that has members standing up for assessing teachers using standardized test scores. The similarly foundation backed “Deans for Impact” joins the table as an extremely small group of education school deans committed to various aspects of current reform efforts, and Relay “Graduate School” of Education is also present, bringing their odd posture as a graduate school that produces no research and which basically uses no excuses charter school teachers to certify other no excuses charter school teachers mainly using online modules. Former Arne Duncan aide Peter Cunningham’s Education Post is present, which is bizarre given its status as primarily a content delivery forum for education reform advocates. Revoltingly, the National Council on Teacher Quality is also on board – NCTQ is a self appointed watchdog of teacher “quality” which has such a rigorous system for reviewing teacher preparation programs that it basically sits in its offices in Washington reading online course catalogs before informing the nation that our teacher preparation programs are all horrible. I suppose representatives from the Center for American Progress, an organization that has long been on the reform side of the Common Core and standardized testing debate, would call this a “Team of Rivals” to match the famed Lincoln Cabinet. I guess that’s one way of looking at it. Another way of looking at it would be if the Academy of Nutrition and Dietetics partnered with the Hormel corporation to design a school lunch program – you hope the more knowledgeable partner is guiding the work, but you strongly suspect that a lot of snouts and tails are going to get in there too. Peter Greene of Curmudgucation rightly notes that many of these principles are laudable – depending upon what actually materializes from them. Given the perspectives and previous projects of many of the partners in this effort, including TFA which stated in The Washington Post article that it felt no need to change its own five week training program to meet the principles outlined above, it is right to be cautious about what will materialize here. If “Reimagining teacher preparation to make it more rooted in classroom practice” means helping to bring more university-school district professional development schools to scale so that prospective teachers can constantly learn from practice while universities and schools inform each others’ work, that would be wonderful. If it means setting up more outfits like Relay “Graduate” School of Education where people with no teacher preparation get competency based modules on no excuses charter school practices, no thank you. 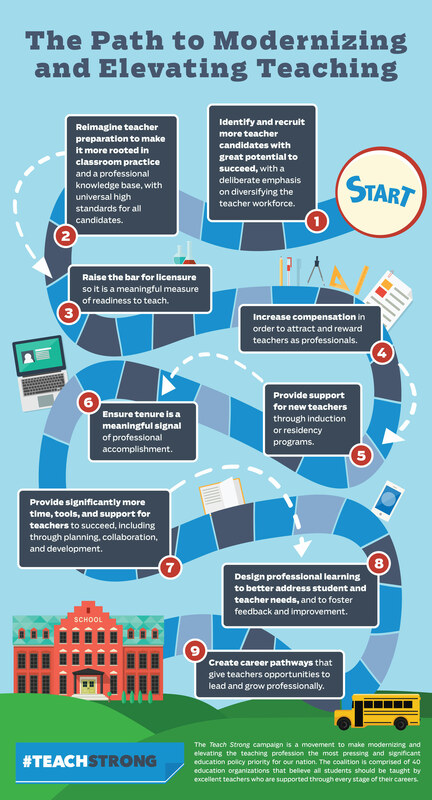 If “Provide significantly more time, tools, and support for teachers to succeed” means giving teachers genuine collaborative control of their professional development and having administrators facilitate teachers getting what they determine they need, fantastic. If it just means more “granular” standardized testing data and a few more resources to jump through SLO hoops, that’s a big meh. If “create career pathways” means acknowledging excellent teaches and finding roles for teachers to play in induction and mentoring, curriculum development, and setting school and district policy, let’s talk. If it just means finding teachers with high value added measures on tests and giving them bonus cash, forget it. While the devil remains in the details, a bit of that devil also resides in some very obvious retreads of past efforts to reform teaching. In fact, efforts to “modernize and elevate” teaching go back to the founding of many of our comprehensive public universities that began as normal schools before morphing into teacher colleges and then to regional universities. At every step of this evolution, there was an odd relationship whereby the field of education was held in disrepute even though the emerging comprehensive universities relied upon the teacher preparation mission of education schools. 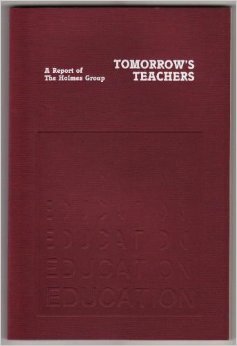 While the model of teacher preparation within a university setting was well established by the middle of the 20th century, this lack of status for the work persisted, and, following the release of A Nation at Risk in 1983, a flurry of activity was aimed at enhancing and improving teacher preparation. 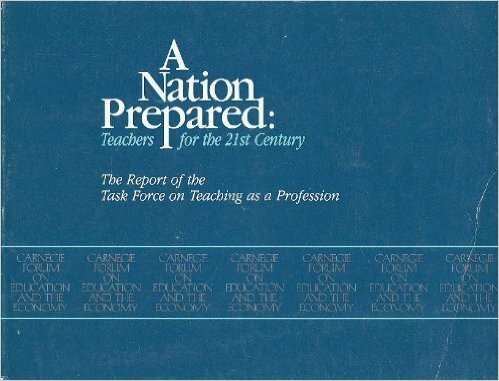 In fairly short order, reports from the Carnegie Forum on Education and the Economy and The Holmes Group produced proposals on how to improve teacher preparation and make it more in line with professional preparation in high status professions. Clinical language and portrayals of teaching as at least a partially technical practice subject to data driven analysis became more common. 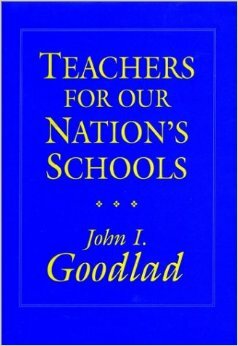 John Goodlad weighed in with Teachers for our Nation’s Schools that included 19 “postulates” outlining the professional territory and responsibilities of teacher preparation. 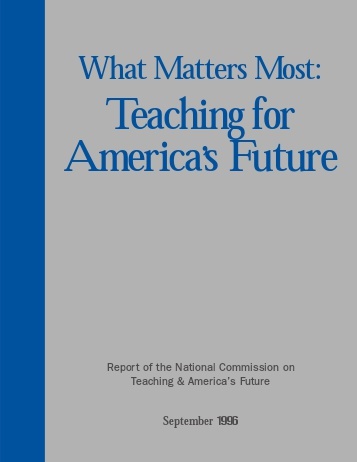 The National Commission for Teaching and America’s Future also provided a summary report called What Matters Most: Teaching for America’s Future which further detailed a professional vision of teacher preparation aimed at replicating crucial elements of high status professions. So let’s just stipulate that this is hardly a revolutionary concept, okay? What might be ground breaking is the standard imprint of 21st century education reform – slick marketing, an emphasis on jamming things through quickly without thinking about consequences, and generally treating problems as public relations issues instead of as structural concerns. I am apprehensive that this is precisely where this is heading in no small part because, like so much else we contend with today, the campaign appears rooted in the notion that everything we are doing in school is obsolete and must drastically modernize immediately or we are all doomed. This is painfully wrong, and anyone who thinks that teacher preparation has remained unchanged in the past 30 years (Yes, that’s you NCTQ) needs to retreat to a library and not come back for at least two semesters. While I will never say that teacher preparation is unable to improve, it is also true that anyone who has gotten a teaching certificate since the 1980s has likely seen significant changes, often positive changes, as a result of efforts previously mentioned. From increased time spent in classrooms prior to student teaching, to stronger pedagogical and content preparation, to vastly improved preparation for working with students with disabilities, teacher preparation has not been standing still, and it would behoove a number of the Teach Strong partners (Again, that’s you, NCTQ) to familiarize themselves with the kinds of evidence that the 656 teacher preparation programs accredited by the National Council for the Accreditation of Teacher Education (since merged with TEAC and changed to the Council for the Accreditation of Educator Preparation) have had to provide in order to demonstrate their strengths. The reality is that our teacher workforce, whether made up of recent graduates from traditional programs who have benefited from changing preparation in the last 3 decades or whether made up of experienced veterans who have been continuously improving their practice over time, is not a static and obsolete lump that threatens our future as portrayed in the Teach Strong launch rhetoric. How we prepare and license teachers grew and developed over a 100 year long period, and there have been significant efforts to develop that process over the past three decades that have actually impacted change. If Teach Strong can work thoughtfully to help increase the scope of the most beneficial of those practices, it will be a positive influence, but if it simply tries to rush in the shallow metrics of NCTQ and the fly by the seat of your pants preparation of TFA and Relay, well, you get the picture. To describe the inclination to teach as a budding vocation also calls attention to the person’s sense of agency. It implies that he or she knows something about him or herself, something important, valuable, worth acting upon. One may have been drawn to teaching because of one’s own teachers or as a result of other outside influences. Still, the fact remains that now one has taken an interest oneself. The idea of teaching “occupies” the person’s thoughts and imagination. Again, this suggests that one conceives of teaching as more than a job, as more than a way to earn an income, although this consideration is obviously relevant. Rather, one believes teaching to be potentially meaningful, as a the way to instantiate one’s desire to contribute to and engage with the world. If Teach Strong is serious about a pipeline of great potential teachers, it had better look harder than most recent reform efforts that constantly emphasize getting the best students into teacher preparation without being concerned whether or not they are driven by the best motivations. It also means that rather than focusing on impossible goals like elevating the salaries of 3 million teachers to the salaries of doctors and lawyers, it would be much better to focus upon working conditions that grant teachers significantly more autonomy and input into how their work and workplaces are conducted. People driven by vocational aspirations may be willing to forgo some compensation – but they cannot forgo having a say in what they do.